Moscardo, Gianna (2008) Community capacity building: an emerging challenge for tourism development. In: Moscardo, Gianna, (ed.) Building Community Capacity for Tourism Development. CAB International, Wallingford, Oxfordshire, UK, pp. 1-15. 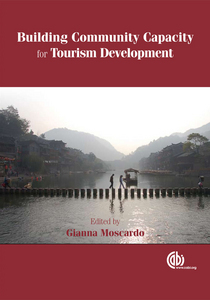 Sentiments such as these have supported and encouraged governments and development agencies in many countries to use tourism as a key tool for development (Hall and Jenkins, 1998; Forstner, 2004). Tourism has been seen as a particularly useful option for developing countries, and in rural and/or peripheral regions all over the world. Substantial resources have been invested in tourism by communities,governments and aid and development agencies. In Europe, for example, the EU claims to have spent more than €7 billion in 5 years on tourism projects specifically aimed at creating alternative employment and revenue options for rural regions facing challenges in sustaining traditional agricultural practices (European Union, 2003). The Australian government spent AUS$31 million in 2 years on regional tourism development projects (AusIndustry, 2005), while in Africa, the World Bank alone has US$3 billion invested in tourism development projects (World Bank, 2006).